Highland dress and the tartan are among the most powerful, romantic and dramatic of all the symbols of Scotland. 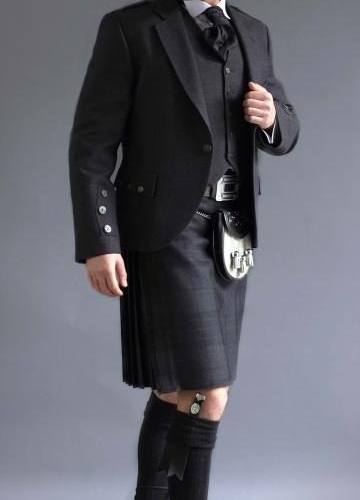 It has been claimed from the history of kilt that 'a man in a kilt is a man and a half' their really is something about the wearing of the kilt that confers extra stature on its owner. It is absolutely no coincidence that the kilted 51st Highland Division was rated by the Germans as the most formidable of all the formations they came across during the First World War. Certainly the British government had no doubts on the matter when, after the defeat of Bonnie Prince Charlie, they banned the use of Highland dress and the tartan, which they clearly saw as an incitement to further subversion. Offenders were killed or sent to the colonies. The form of Highland dress has always owed much to the army and it was the Highland regiments which kept the Scottish kilts and the tartan alive until at last, in 1782, their use was once more permitted. Before that time, Scots were only permitted to wear any Scottish wear, if they joined the British Armed Services. Pipers were permitted to wear their kilt, but usually in a Regimental color. Other service men - most were permitted to wear the balmorals with their clan badge on it. A high price to pay to wear highland clothes, laying their life on the line to do it. Today, tartans abound and it is an unfortunate person indeed who will not be told by the kilt shops that he or she indeed can buy 'their' tartan. The ascribing of a vast plethora of names to membership of various clans has long been an industry in itself - luckily there is insufficient time or space here to enter into that particular subject! The element of fantasy is still with us today now that kilt Scotland is popular as never before. There is something that is very special indeed about the kilt and the tartan. It is a limp back indeed that does not straighten as the kilt is buckled on and a poor heart that is not lifted just a little, at the sight of the colors of the clan. Kilt history brought us to this point when kilt become, beyond any doubt, the national dress of Scotland. Let us keep it that way and ensure it is not allowed to decline into mere fancy dress.